A crown is used to cover a damaged, broken or decayed tooth. 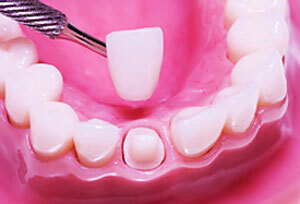 Your tooth is first filed down to allow the crown to solidly cover it. A temporary crown is made and placed over the treated tooth, and once ready, your custom-made crown is placed and cemented on. Our dentists utilize top-quality porcelain to make your custom crowns. Natural looking and durable, they emulate real tooth enamel. The porcelain is also bio-compatible with your body so there will be no irritation or trouble with the crown in the future. A shade guide will be used to select the proper shade for your crowns. 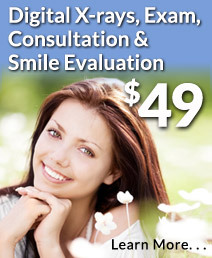 For an exact match to adjacent teeth, one of our dentists will use custom shade matching. We can take any low-quality, older crowns made from non-durable materials or crowns that have already broken down, and replace them with all ceramic, bio-compatible ones. Our dentists can perform a complete examination and evaluate what should be removed and replaced to optimize esthetics and your oral health.